» 2017 GRENACHES DU MONDE: 5th edition in Sardinia was an international success! 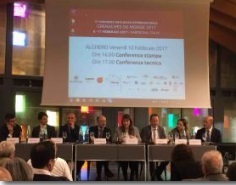 The fifth edition of the International Grenaches du Monde Competition, launched in 2013 by the Conseil Interprofessionnel des Vins du Roussillon (CIVR – Interprofessional Board of Roussillon Wines), took place this year in Sardinia on February 10, 2017, and it was a big success. The International Grenaches du Monde Competition has outdone itself again. In 2017, after being moved to Aragon, home of Campo de Borja (Denominación de Origen), in 2016, the event took place for the first time in Sardinia, thanks to a partnership with the LAORE agency for agricultural development. The jury was made up of 100 wine professionals from 15 different countries (England, Australia, Belgium, South Korea, Spain, the United States, France, Greece, Holland, Italy, Japan, Lebanon, Lithuania, and Slovenia). A total of 684 samples (+19% compared to 2016) from 8 countries (South Africa: 1, Australia: 3, Spain: 322, France: 149, Greece: 1, Italy: 204, the Republic of Macedonia: 2, and for the first time, Lebanon: 2) competed. The record participation numbers at the 5th edition of this event reflect the importance and renewed interest in Grenache—an iconic varietal. Sardinia hosted the International Grenaches du Monde Competition from February 9 2017. The island features 24,000 hectares of vineyards, including 7,500 hectares devoted to Grenache, locally known as “Cannonau”, especially in the region of Nuoro and its 5,700 hectares. The Grenaches of the World event had many highlights over the three days. From tours of Sardinian vineyards to interactions with the people who work them, the jury (made up of wine professionals) was able to speak with winemakers, share their experience, and taste local wines. Culture, tradition, and gastronomy were also key features of the event, with a visit to Nuoro’s ethnography museum, a meeting with Mamuthones, Sardinian songs sung by the polyphonic choir, a tour of Barumini’s Nuragic site, and tastings of typical Sardinian foods. 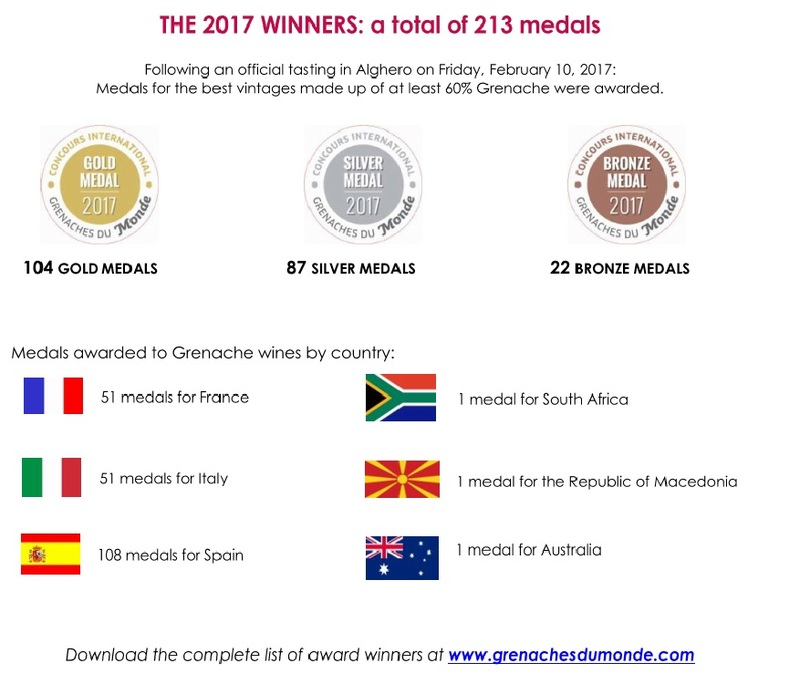 Sardinia and Cannonau were at the heart of the 2017 Grenaches du Monde event. After the competition, six professional presentations were given on the origins of viticulture in Sardinia, the Grenache varietal and its typology, as well as on climate change and water management in Languedoc Roussillon. It was a wonderful occasion to share experiences. To close the competition’s 5th edition, the city of Cagliari hosted an Evening of Grenaches du Monde at the Manifattura Tabacchi (a former tobacco plant). The unique evening was open to the public and offered a tour of the globe through the senses. Nearly 700 people—from the curious to enthusiasts to jury members—attended the event, where they experienced the wealth and diversity of wines made from Grenache and sampled the 684 competing wines. Chaired by Francesco Morandi (Minister of Tourism, Craftsmanship, and Commerce of the Autonomous Region of Sardinia), the press conference took place on Friday, February 10, 2017 in Alghero. In attendance were Mario Bruno (Mayor of Alghero), Maria Ibba (General Manager of the LAORE Agency of Sardinia), Agostino Cicalo’ (Chairman of Sardinia’s Chamber of Commerce), Marzia Cilloccu (Adviser on industry, tourism, and equal opportunity policies for the city of Cagliari), and Andrea Soddu (Mayor of Nuoro). Fabrice Rieu (Chairman of the CIVR) thanked Sardinia and LAORE for their hospitality and the organization behind the 5th edition of this event. The location for the 2018 International Grenaches of the World Competition was officially confirmed, and the floor was given to Meritxell Serret (Catalan Adviser for Agriculture within the Generalitat of Catalonia), who came specially to show her enthusiasm for the event’s 6th edition in Catalonia, in TERRA ALTA.